1950 until 1980 was certainly an interesting era: The implications of post-second world war sentiments paired with the omnipresence of violence and brutality that has been witnessed first-hand on one side, and the extraordinarily fast development of technology and industrial capitalism on the other. Anxiety was in the air: Technology and science brought welcome innovations, yet it came in tandem with the production of means that could render us all extinct. This anxiety paired with a questioning of rationalism was reflected specifically in the art world, where irrationalism was not just juxtaposed to reason but found its manifestation in challenging and at times disturbing works with the ultimate goal of questioning traditional notions of harmony and harmony in the realm of aestheticism. Works by around seventy artists from all corners of this earthround are examined and depicted with the focus being the irrational, the delirium of disorder within a range of contexts – societal, culture and Western civilisation at large, literature and politics – and via a range of media old and new, e.g. sculptures, paintings, photography to audio recordings, videos and book designs. 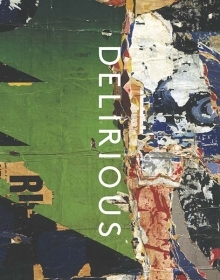 Delirious: Art at the Limits of Reason, 1950-1980 is an ode to experimentation with irrationality and unorthodox, often perplexing techniques, which ultimately culminated in the genesis of a new aestheticism, i.e. it created answers to the questions it set out to raise to fight the inequilibrium of turbulent times. A thought provoking book that rings strangely familiar, finds relevance in our times and serves as a vital source of inspiration as well as a refuge with those being at odds with their surroundings and the climate we find ourselves in today.